With its compact design and USB power source, the Heller 10cm High Velocity Mini USB is the perfect desk accessory. 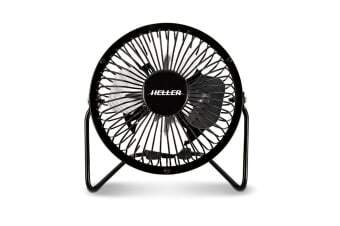 Enjoy the refreshing breeze produced by the Heller 10cm High Velocity Mini USB Fan, which is the perfect fan to have on your desk at work or home. Get the perfect breeze with the 360° adjustable tilt.